During the middle 1960s, several centres creating highly original new music appeared independently - unknown to each other and to the rest of the world at first. Two of the most important of these centres were Chicago and London. Both were strongly influenced by the New York City based free jazz scene, yet both reacted against certain aspects of it. For instance they both used a lot of space, often involving extended quiet passages that ventured near and even included silence, and they put greater emphasis on improvising as a group, rather than as soloists with accompaniment. Both were also strongly influenced by contemporary composed music, and by several genres of traditional music from around the world. Two of the leading exponents of these two centres were Anthony Braxton (b. 1945) and Derek Bailey (b. 1930). The former grew up in Chicago, whereas the latter did not move to London until the mid 1960s, having grown up in Sheffield. The two first came into direct contact when Braxton spent some time in London in 1971. They first worked together at a 1973 Braxton quartet concert in Paris that began with a duo piece. The concert preserved on this CD was their second public performance together, and was the first time that Braxton had officially performed in Britain. It was also one of the first concerts of improvised music to take place in the Wigmore Hall. The first part of the rehearsal held the previous day established what the musicians did not want to do - Bailey did not want to play notated compositions in unison, while Braxton did not want to improvise totally. A compromise was reached. Each half or set of the concert was to consist of a (different) sequence of six predetermined areas to improvise in. Thus, for example, Area 2 is around staccato sounds, Area 6 about sustained sounds, Area 10 about repeated motifs, etc. One section of each set, however, was left open (unpredetermined) to allow for the inclusion of other ideas that might arise during the concert. (These are Area 3 and Area 11). Also one section of the First Set was designated a guitar solo (Area 4), and one of the Second an alto saxophone solo (Area 9). Each of the two sets was played without a break. Note that for most of the concert, Bailey played a normal electro-acoustic six-string guitar augmented by stereo amplification, with the sound coming out of the two speakers controlled by two volume pedals. In Area 7 and Area 8, he used his then other guitar, which had about nineteen strings, enhanced by a small practice amplifier. Two of these strings were "contra-bass" ones which went around his feet. Unfortunately, there is not enough room on this CD for the rehearsal extracts that were previously issued on LPs, and these do not add enough material to make up two decently filled CDs. These are now available on Emanem 4027. "The most interesting new Braxton release is on the Emanem label featuring Braxton with guitarist Derek Bailey. It's the relationship between Braxton's busy, constant creation on six different horns and Bailey's response to it that provides the album's fascination. Bailey's playing will turn guitarists around. He shuffles through clipped harp-like harmonics, totally muffled sounds, and the percussive rattle of slackened strings. He allows Braxton room to do anything and everything, only to turn around at inconceivable points and match one of the saxophonist's many splattered 64th notes with a perfectly suitable sound of his own. Braxton's contributions include some tasteful flute and an absolutely fierce, howling, gurgling alto solo." "I would see this record as an attempt by two men - each to an extent different from the other musically, but each obviously admiring the other's music very much - to work together on some common ground. That they succeed to such a remarkable degree in creating music of the kind of rare beauty which this music is tribute to the giant-sized stature of both. In lesser hands, this kind of meeting might have turned into a real disaster, with both musicians working to considerable cross purpose. But Braxton and Bailey truly seem to bring out the best in each other." "What stands out about the best parts of this disc is that Braxton and Bailey are listening to each other. We get to hear as each musician changes his playing to match what the other is doing. We also hear how these two musicians' backgrounds meld. Braxton brings a blues-based aesthetic to his playing, while Bailey's guitar sounds like it's straight out of the tradition of late Twentieth Century European music. These two traditions merge well in the playing of these two musicians." "Between them, Anthony Braxton and Derek Bailey must have released hundreds of discs, yet this duet is thrilling. Braxton hovers like an angry wasp, Bailey is mind-bendingly on form." 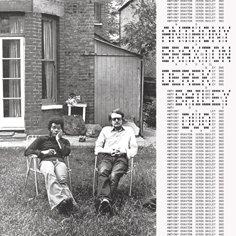 "These twelve duets between African-American avant-gardist Anthony Braxton and Brit Derek Bailey are remarkable for several reasons, not the least of which is that this is the first recording of these two seminal figures performing in tandem. Coming from entirely different traditions of free music, Braxton emits a more melodic, tonal approach, while Bailey exemplifies an atonal, abstract concept. The results are hugely successful, with the two meeting halfway. The duo recorded here is surprisingly accessible, and contrasts two complementary approaches within the free music genre."